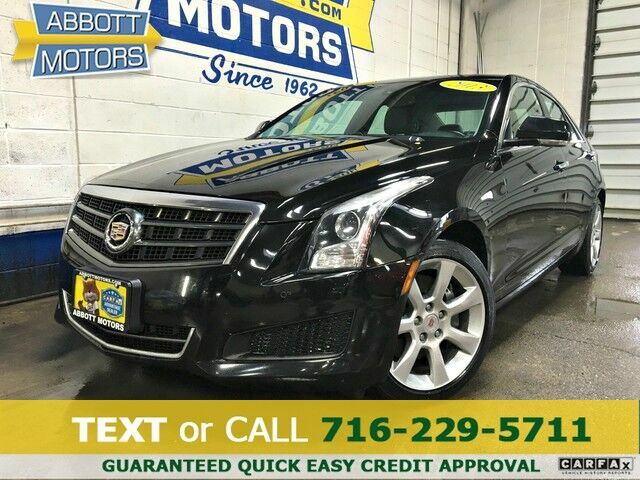 ABBOTT MOTORS, An exceptional car buying Experience, is offering this exceptional Black Raven 2013 Cadillac ATS Premium AWD w/Low Miles for sale. Drive home in your new pre-owned vehicle with the knowledge you're fully backed by the CARFAX Buyback Guarantee. The Cadillac ATS Luxury AWD's pristine good looks were combined with the Cadillac high standard of excellence in order to make this a unique find. When driving an all wheel drive vehicle, such as this Cadillac ATS Luxury AWD, superior acceleration, traction, and control come standard. With less than 66,790mi on this Cadillac ATS, you'll appreciate the practically showroom newness of this vehicle. Added comfort with contemporary style is the leather interior to heighten the quality and craftsmanship for the Cadillac ATS Beautiful exterior. Clean interior. This Cadillac ATS is so immaculate it is practically new. The incredible 2013 Cadillac ATS Luxury AWD is an invigorating performance machine that will pump adrenaline into any driver who dares to take the wheel. Do you really need any other reason to want one? This highly refined Cadillac ATS comes with exciting features you'd expect in a vehicle twice the price. This Cadillac ATS comes with new tires for an improved ride, better fuel economy and quieter drive. The paint on this car has no serious defects, blemishes, scratches or scrapes. This hard-to-find gem is an exquisite example of meticulous attention to detail and rich refinements. Upgraded wheel package makes this Cadillac ATS stand out from the rest. ABBOTT MOTORS has over 50 years of automotive experience! We are also a CARFAX Advantage Dealer. We offer great deals and specialize in FINANCING FOR EVERYONE-ALL CREDIT APPS ACCEPTED! We look forward to helping you purchase your next vehicle. CALL or TEXT (716) 229-5711 for quick answers to your questions about this vehicle. Your message will be answered by a real human never an automated system More information about the 2013 Cadillac ATS: The Cadillac ATS competes with other compact luxury cars from BMW, Audi, Mercedes and Lexus. While previous efforts had focused on comfort over performance, the ATS represents a firm departure from this strategy, Cadillac opting to match BMW with a strong emphasis on rear-wheel-drive handling and a lightweight body structure. The ATS starts at about $33,000, undercutting the price of a 3-series BMW by about $3,000. Interesting features of this model are traditional Cadillac luxury, Excellent handling, rear-wheel-drive, and a variety of fuel efficient engines STOP IN TODAY or Apply Online 24/7 at Abbottmotors.com ... All Trade-ins Welcome... Same Day Delivery... Call or Text Today and See The Difference... We Look Forward to Serving You! !This vehicle may be subject to potential open recall(s). Vehicle recall information may be found at Safecar.gov. Please verify price, equipment, options and features with your sales rep before your purchase. We Look Forward to Serving You. *Tax, title, plates extra. All Financing On Approved Credit. BBB accredited A+ member.